Everyone has a risk for committing crime. A small number of people are at extremely low risk, and a small number are at extremely high risk. Most of us fall somewhere in the middle. What factors are associated with increased risk, and which of those factors are amenable to modification? Are certain factors unique to individuals with ASD? I realize this is an upsetting topic. Who wants to think about the possibility — no matter how remote – of someone they know committing a crime? Nevertheless, if we continue to let ourselves be lulled by the mantra “Our kids don’t do that,” we are not going to make progress. In a study out of Japan, Kawakami and colleagues administered the “Childhood Adverse Events” questionnaire to 175 subjects with ASD (Male: 147; Female 28; mean age ~ 16 years; range 6-30 years). 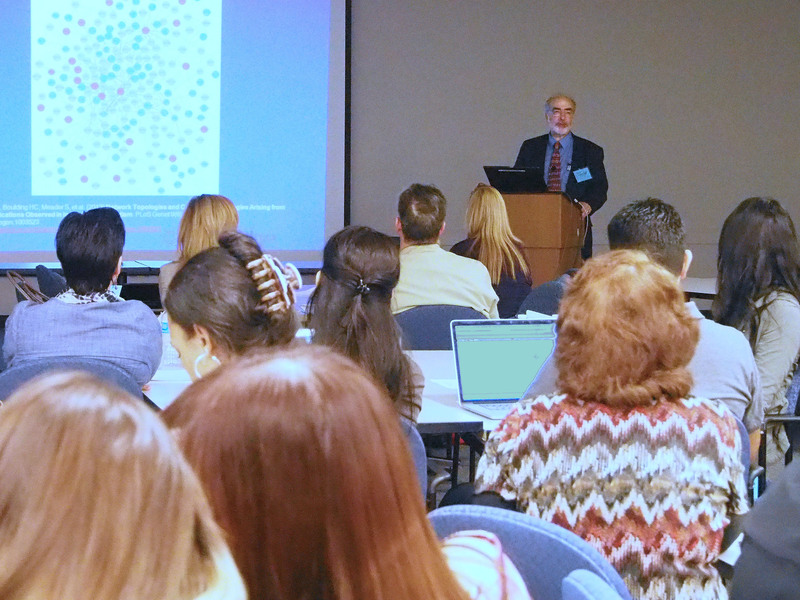 Thirty six were criminal offenders, and 139 were non-criminal ASD controls. Criminal acts included theft, sexual misconduct (voyeurism, juvenile prostitution), violence, running away, arson, blackmail, and internet harassment. The “Childhood Adverse Events” questionnaire included all the items from the ACE, plus hyperactivity and being a victim of bullying (both of which have been shown to be associated with later criminal behavior in neurotypical subjects). The researchers also recorded several ASD-specific items: High Functioning Autism Spectrum Disorder / Asperger Syndrome vs. classical autism; IQ equal to or greater than 70 vs. IQ < 70, and age at diagnosis. What they found was surprising: The strongest predictor of criminality was childhood neglect, which was 15 times more common in the “criminal” group than in controls. 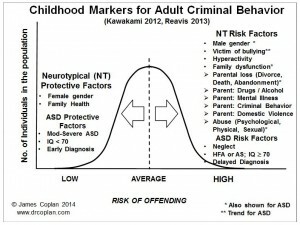 (This is especially noteworthy in light of the fact that neglect did not show up as a risk factor in Reavis’ study of neurotypical offenders, and makes us wonder about heightened vulnerability of children with ASD to the effects of neglect. We will have more to say on this in a future post.) 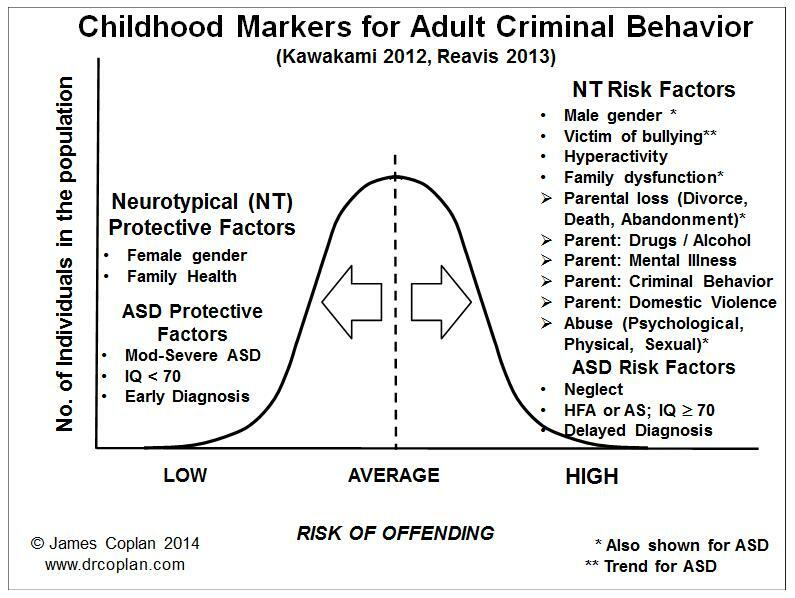 Similar to what was observed among neurotypical offenders, additional risk factors among offenders with ASD included parental loss (typically as a result of divorce), and a history of physical abuse. 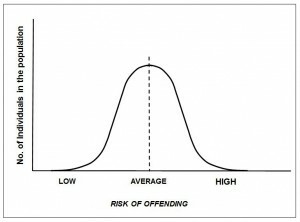 The investigators did not detect a statistically significant increase in risk for criminality associated with childhood hyperactivity, being the victim of bullying, or parental drug use. It is hard to imagine that children with ASD would be less vulnerable to the effects of these stressors than children with neurotypical development. 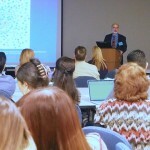 More likely, the failure to pick up a signal from these factors is either because of the small size of their sample (in technical terms, the study is “under-powered,”), or because some of these adverse events, although detrimental, may be nearly universal among children with ASD and thus not turn up as “statistically significant” differences between offenders and non-offenders (victim of bullying, e.g.). 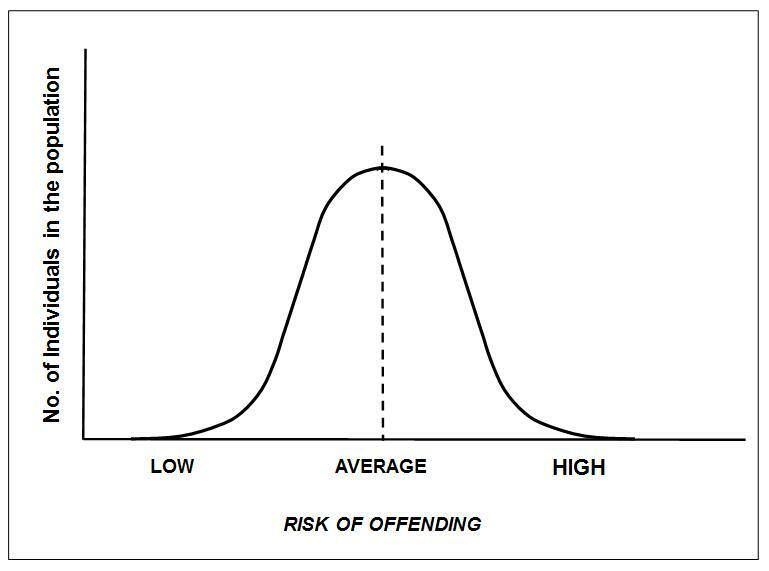 As for the ASD-specific variables, individuals with High Functioning Autism or Asperger Syndrome, and individuals with IQ of 70 or above, were at greater risk for criminality than individuals with classical autism or IQ below 70. Delayed diagnosis was also a risk factor: The likelihood of future criminality went up 120% per year for every year of delay. For example, a child who was not diagnosed until age of 10 was about 2.5 times as likely to commit crime as a child diagnosed at age 5. What might all of this mean? More next time.